As the Asia Pacific region is so large and covers 31 main countries, Oleeo worked with Universum on reviewing findings of two particular business hubs – Singapore and Hong Kong. 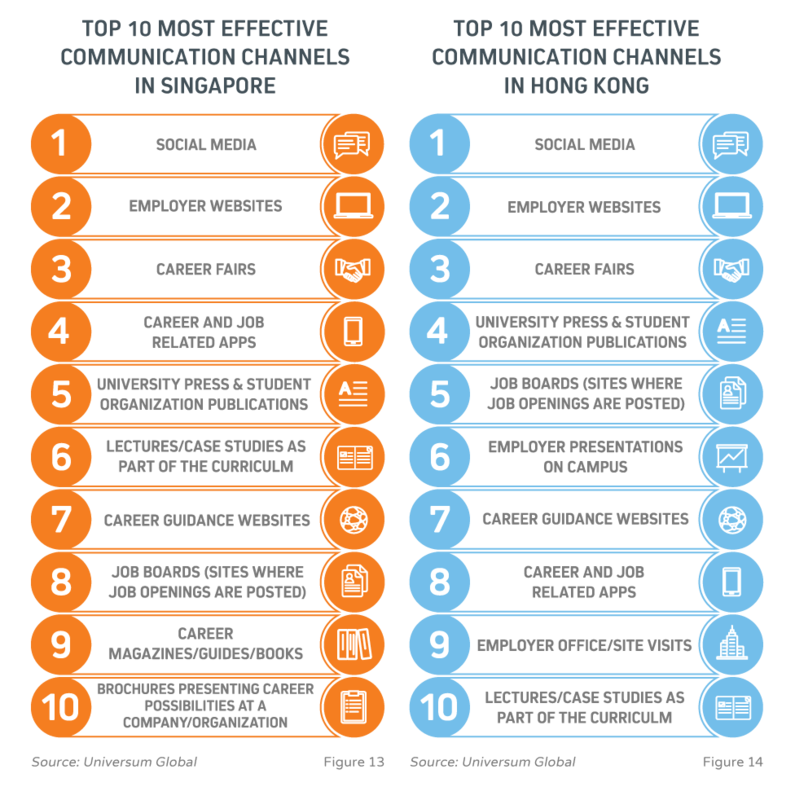 Recruiters across APAC ranked Talent Acquisition as the 3rd largest challenge their companies are faced with according to Deloitte Future World of Work report. Hiring for graduate programs or internships or internships is no small feat. Although APAC is now home to over 55% of the world’s graduate population (and growing), the region is not immune to the global talent shortage. Indeed Manpower found Japan, Taiwan and Hong Kong to be 3 of the top 4 countries suffering of the most talent shortage worldwide. What do students in the Asia Pacific want from future #careers? Download @Oleeo_’s Must-Know Student #Recruiting Trends for 2018 and find out!Tweet This! Oleeo sought to examine the key findings identified by Universum by analyzing 253,000 graduate applications across its APAC client base. These cover offices across the region including Singapore and Hong Kong – also reviewed were roles advertised in offices in Shanghai, Sydney and Mumbai. Before revealing the results noted by the Oleeo investigation, it is helpful to understand more about the preferences of 4,486 business students surveyed by Universum across the two regions. Significant ranking gaps can be observed in specific industries between male and female students. Banks (especially investment banks) are regarded as attractive employers by more male students. On the other hand, employers in the Public Sector and Governmental Agencies are more popular among the female students – However, banks continue to decline in popularity among Business students in Singapore. This is reflected by the industry’s average rank standing at 15th in 2012, and 40th in 2016, dropping by 25 ranks. The plunging price of oil barrels in 2016 (which at one point fell more than 70% compared with June 2014 levels) has raised concerns about the stability of the energy industry. The energy industry’s average rank declined, with employers such as Schlumberger down ranking from 70 to 93, BP down from 56 to 78, and Singapore Petroleum Company down from 32 to 39. In Singapore, according to the Labor Force Survey findings released by the Ministry of Manpower, the average unemployment rate in 2016 rose to its highest since 2010. With less optimism in the job market, students have also lowered their salary expectations. This can be seen from the decrease of SGD$1,251 in expected annual salary, compared to last year. In Hong Kong, in general, salary expectations among students declined across all main fields of studies, with the exception of Business students who expected a range that is relatively similar to last year’s. There is a significant gap between male and female students on the attractiveness of Corporate Social Responsibility when assessing an employer. A much higher proportion of female students regarded social responsibility as an attractive employer attribute with a ranking position of 19th, which is much higher when compared to the 32nd ranking among male students. Since 2009, the achievement of work/life balance has been ranked as the number one career goal among Hong Kong students. In fact, it is the number one career goal among students in every single main field of study. The top 5 most attractive attribute preferences for Hong Kong students are a friendly work environment, professional training and development, good reference for future career, high future earnings and clear paths for advancement. The same five take priority in Singapore with small order variations. 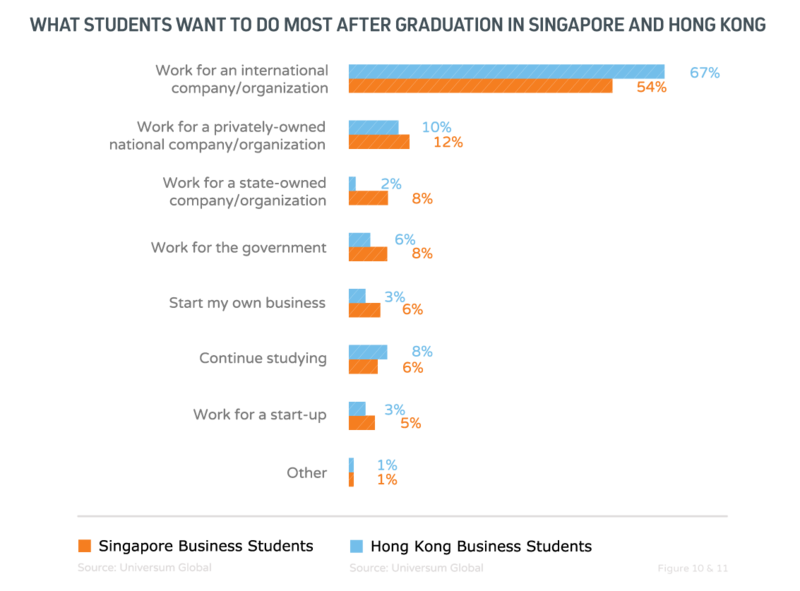 Students in the region are aspirational with what they want to do most after graduation but in Hong Kong more students said they wanted to continue studying, while in Singapore working for a state-owned company/ organization was a higher priority than anywhere else in the world. This can be seen in the graphs below. It is important to note that while countries like Singapore or Hong Kong are closer to EMEA recruitment habits, anyone who tried to recruit in India is now familiar with the incredibly fast pace of early talent recruitment (sometimes as fast as 1 day recruitment cycles). Equally, anyone recruiting in Japan would be wise to spend time understanding how the strict local recruitment timetable works, or how dire demographics are impacting recruitment behaviors, forcing organizations to increase the proportion of international talent they hire. Like the rest of the world, competition is extremely high – only 2% of between 40 and 60,000 applicants will get offers. Female hiring is starting to show signs of growth year over year, growing from a quarter of hires to around just over a third. Recruiters rely heavily on screening to whittle down lists putting more emphasis on answers to questions than other parts of the world. Withdrawal of applications is low in percentage terms across APAC. Decline and renege rates are high, though not as much as the Americas - employers must focus more on engagement to retain top talent. As noted in the introduction of this report, we have also looked at the migratory patterns of applicants stretching over 200 countries. 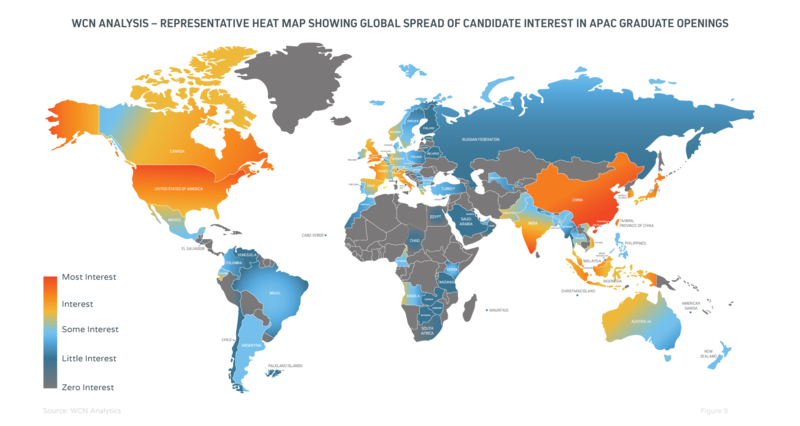 From the data scrutinized for APAC, we found that consistently, a third of applicants are from outside of the continent. However, only around 10% of roles are filled by international recruits – many from the UK and US. Here is a heat map showing this international split. Career goal messages around work/life balance, job security and stability, having an international career, and the ability to become a leader or manager of people and to be dedicated to a cause or to feel that they are serving a greater good were the most highly desired amongst business students surveyed by Universum across Hong Kong and Singapore. This was reiterated by a leading expert in the APAC region. Have #salary expectations for students in the Asia Pacific declined? 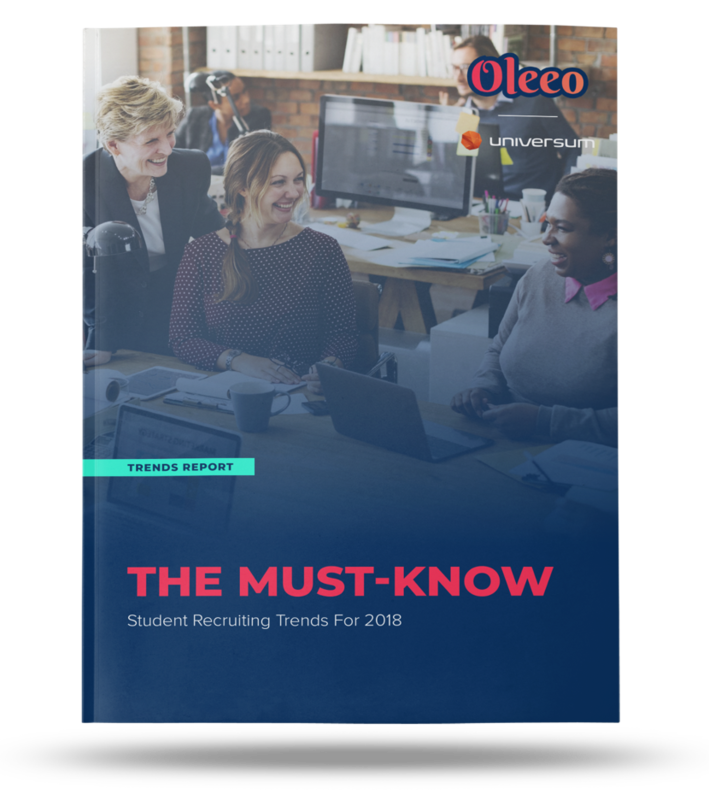 Find out in @Oleeo_’s Must-Know Student #Recruiting Trends for 2018 report.Tweet This! At Oleeo, we have seen lots of fantastic improvements across our client base from facilitating intuitive application forms to allow for increases in applications to improving the ease of scheduling interviews and enabling a 92% increase in interviewed candidates in some cases. Oleeo recently started working with PWMA (the Private Wealth Management Association). PWMA and the Hong Kong Monetary Authority have partnered on an initiative aimed at promoting Private Wealth Management in Hong Kong. In order to tackle talent scarcity in the region, PWMA had the great idea to get local Private Wealth Management actors to band together to create a 2-year apprenticeship program. The program is promoted via joint events. The program has been a huge success with a great student response, and 13 different organizations (including UBS, Credit Suisse, Bank of China) all working together to promote their industry, and in the process to attract candidates they could not have reached by themselves. Engagement is also achieved through increasing brand presence and on-campus activities, making Superday organizing much easier and faster using innovative interview techniques - thereby helping to facilitate greater confidence in quality of candidates and subsequent increases in the number of hires. Morgan Stanley is an example of a firm using Oleeo worldwide that has focused on these improvements to deliver meaningful business results. Most recently, it has been promoting its employer brand with the tagline ‘What Will You Create?’ ran across print, digital and social channels starting in time for the campus recruiting season including Snapchat and Instagram and the revival of a corporate Facebook page that was previously deactivated in 2011. Through the campaign, the firm invites candidates to consider who they will become and the impact they will have through a career at Morgan Stanley. The efforts have paid dividends globally and gained impact in the APAC. The firm built a stronger brand at target universities with high touch candidate experience, more year round campus presence and accelerated processes. This is proven by Morgan Stanley’s improved rankings in the Universum 2016/17 Most Attractive Employer Rankings in many of the countries it recruits from and its consistent feature in the top 15 World’s Most Attractive Employer Rankings. 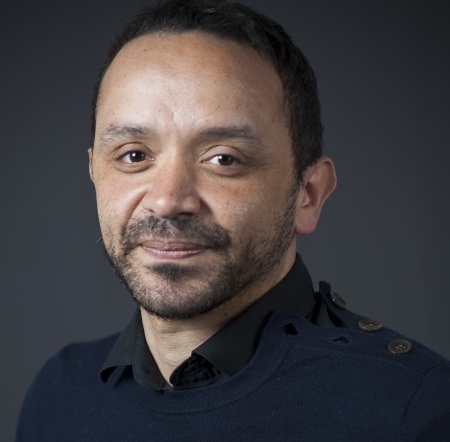 Importantly, the company was able to take learnings from digital interactions and devote attention to running more events outside the busy autumn cycle with some regions also pushing up their recruiting timeline. These crucial school outreach events and programs help pipeline into spring and summer analyst schemes. Interacting with promising talent earlier has helped – and continues to help - increase applications to the Morgan Stanley campus programs and also helps the rm to build on its brand awareness and diversity intakes aligned to operational goals.